Higher Ground Farm founder John Stoddard is all about moving on up—especially when it comes to urban agriculture. 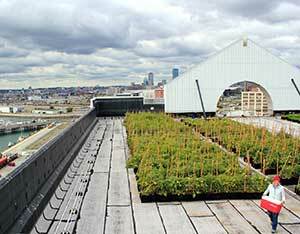 In 2012, Stoddard wrote a guest post for Seedstock highlighting the potential of rooftop farming. At the time, he and his business partner, Courtney Hennessey, were searching for a roof space to farm. They’ve since started farming on the roof of the Boston Design Center, a 55,000 square foot space in South Boston, and completed their first farming season in 2013. After a successful first season, Stoddard and Hennessey are looking to continue their success by diversifying their products and market as they move into their second season. “Long term we would like to expand into our existing space— we are only using a portion of our leased space— and open more farms on other rooftops,” says Stoddard. To expand their product selection, they are adding a few new crops to their roster this season. For their first season, they grew tomatoes, greens, and herbs. This year they plan to grow more herbs, greens, tomatoes, edible flowers, and to experiment with potatoes and cucumbers. Stoddard says, like most farms, they base their crop selection on customer demand, but they also have to consider unique environmental factors that come with farming on a rooftop, like limited soil depth, strong wind, and full sun growing conditions. In their first year, Stoddard and Hennessy kept their market plan fairly straightforward; they sold mainly to restaurants and had an on-site farm stand. Moving forward they hope to expand their approach. They are currently considering starting a CSA and participating in farmers’ markets. These ideas, however, will likely not be implemented until the 2015 growing season. In his 2012 guest post, Stoddard briefly discussed Article 89, the urban agriculture rezoning initiative launched by the Boston Redevelopment Association. The initiative, which was formally passed into law this past December, provides guidelines for urban agricultural practices like aquaculture, hydroponics, and aquaponics that previously remained unaddressed in Boston law. The initiative also outlines zoning requirements for farms operating on rooftops, like Higher Ground Farm. Stoddard is outspoken about his commitment to urban agriculture and its numerous benefits. Like many in the urban agriculture field, he sees urban agriculture as a mechanism to bring about a societal paradigm shift that would impact not just what we eat but how we live our lives. To Stoddard, the connection between people and their food is especially crucial to this shift. “Urban agriculture connects people to food, hopefully improves access to fresh foods, and hopefully also makes Bostonians more food secure,” he says. Stoddard also believes firmly in the benefits of urban agriculture as they relate specifically to his chosen modality: rooftop farming. Since space in urban areas is limited and in high-demand, Stoddard sees rooftop farming as the future of urban farming; rooftop space is plentiful and there is very little competition for it. Rooftop farming has environmental and economic benefits as well, says Stoddard, and he encourages towns and cities to start taking advantage of these benefits. “Green roof farming is a challenging business model but has potential to bring green jobs, fresh food, and environmental benefits to cities. States and cities can support green roof farming through tax incentives, subsidies, and grant programs for small farms and green businesses,” says Stoddard. According to Stoddard, the societal benefits of urban farming as a whole and rooftop farming in particular underlie the vision of Higher Ground Farm and continue to play an important role in the farm’s goals moving forward.